Be sure your betta has a nice sized home. Although bettas are typically "used" to living in very small spaces, they should be given the opportunity of a bigger home, being that they are kept in captivity. Get some tank-care equipment. 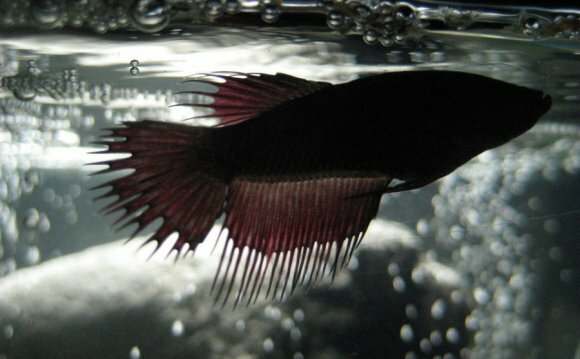 You'll need a filter to help maintain the tank's cleanness and the betta's health. Just go to your local pet shop and ask someone in the fish department about a suitable filter for your chosen tank. You may be wondering if you'll need a heater for the tank; this is not necessary! For the most part, bettas can do well at temperatures around 60 degrees Fahrenheit, thought they are tropical. So unless your home is an ice box, don't worry about buying a heater. Add gravel. This is the fun part; you can choose gravel for your tank! When you're at the pet shop, take your time and have fun picking out some gravel for the tank. There are so many colors available! And in a range of sizes, from sand, to large river-sized rocks. Choose whatever fits your like and tank. Get some plants for the tank. Bettas, like any fish, will want a little privacy at times, and plants can provide that. Plastic plants are more popular, as they require less care than live plants (and aren't edible, either!). It's your choice. Hide-aways can be in almost any shape or form these days, even the classic castle. And it's not just plants and hide-aways; there are lots and lots of just decorations. Perhaps you'd like to get a little something special to spruce up the tank for fishy? Don't forget to get fish food! Fish food comes in lots of choices: pellets, flakes, dried (dead food), live food, etc. But which do you choose? Well, you're going to have to experiment a little on this one. Bettas can have their likes and dislikes. Yours may like flakes better than pellets, and vice versa. Or the same with dried or live food. For now, just start off with some betta pellets and flakes. For a week, feed one of the two. If your betta doesn't seem to care for it that much (let alone eat it), try the other. Set up. After you've set up the aquarium, let the water sit for a day or so. This allows any chlorine in it to evaporate, although you'll still have to add some dechlorinator later. Check the temperature. Bettas prefer water temperatures between 72–82 °F (22–28 °C). If the temperature is between those two, this will be great, and help your fish settle in. This is the best part. Now that you have the tank at home all set up, you can go and get your fish. Be careful, though. Not all fish are in health grade A. Some may be healthier than others, and you need to be careful that you don't end up with a sick fish. Enjoying your Crowntail Betta. After you've allowed your betta to settle and get used to the water temperature (before you let your fish out of the bag it came in), you can now enjoy your new fish friend! Take ongoing care of your betta. Be sure to feed your fish once daily and clean the tank once a week. And be sure to watch for signs of illness. If this question (or a similar one) is answered twice in this section, please click here to let us know. Make sure to keep your betta fish safe, healthy, and happy.